Jose Esparza and Jeff 'Hollywood' Lennon have their baseball game strategies going today. Wait, it is football season, right? Hey, put a $200 bounty on a player's head with a $250 buy-in and who knows where the conversations go. 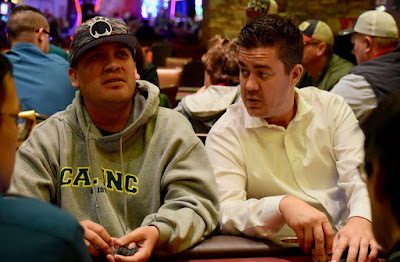 Two levels are down - 4 levels left in registration and a single re-entry per player - and among those already in the field is Mike Harvey, Bill Watchman, Al Sanchez, Marty Gorenc, Matt Boddorf, George Cabrey, Theresa Cummings, Chris Hinchcliffe, Steve Kujubu, Sharon Sanchez and Lance Donnell.